In July 2019 students from all over Europe will, for the first time, have a chance to compete for the European Universities title in beach handball. The European University Sports Association (EUSA) and the European Handball Federation (EHF) have joined forces to organise the inaugural EUSA-EHF Beach Handball Championship, which will be held between 24-27 July 2019 in Zagreb, Croatia. The event will take place at Lake Jarun, the venue for a successful European Beach Handball Championship in 2017. 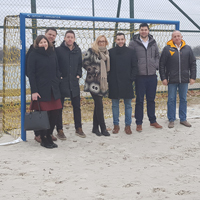 The first inspection visit took place on 18 and 19 January, attended by EUSA Sports Manager Besim Aliti, EUSA Beach Handball Technical Delegate Jelena Rakonjac and EHF Beach Handball Commission member Marco Trespidi. The EUSA and the EHF representatives also met with the representatives of the organising committee. Sport and accommodation venues were inspected, and other operational matters discussed. The organisers have shown attention to detail and are ready to host university teams from all over Europe. Registrations are already open and universities wishing to participate can submit their application through the event’s official website.